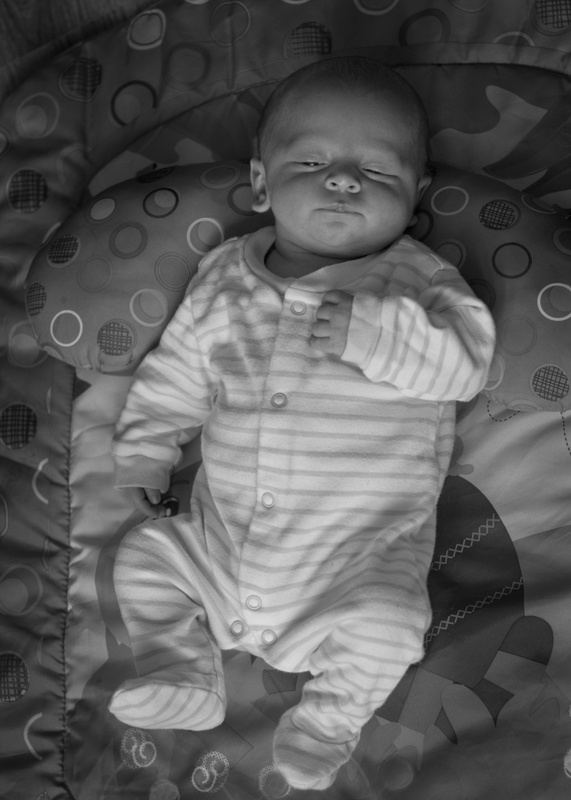 Okay, thought I'd ask for feedback of this pick I took of a friend's baby, I've turned it to black and white to give it more of a mood plus the colours of the mat the baby was on were really distracting, any comments and feedback would be gratefully appreciated. glad you are posting images for critique. You have done a nice job converting to mono and I can see why. Even in mono the matt is distracting. I love the knackered gaze he has on you. Really cute. My biggest concern is the viewpoint. From directly above, he looks like he is standing but obviously isn't. Actually he might be about to do a gig! Seems a bit unnatural to me. this is emphasised even more by the way you have lit him. If you look the light is coming from his feet area, so it is hitting his face from the chin. This accentuates his head form. You know how to scare kids you can turn the lights off and put a torch under your chin. You have a slight case of that here unfortunately. Next time ask mum for a plain blanket to hide the mat and look at the light. Hope that helps, it is intended to. It's very crisp and clear so well done you. Yes I can see what both of you are saying now, I wasn't sure of the photo myself but did like it, yes mum is happy with it, glad she's not a photographer lol.